Just about every waking hour of my Japan experience was enjoyable and memorable in some way or another. Even when it became time eat I was still being adventurous almost all the time. I have already covered quite a few of my gastronomical adventures when I visited Japan such as eating Hitsumabushi or barbecued eel, devouring a tub sized bowl of Ramen, my favourite – Yakitori and even easily available Japanese fast food like Yoshinoya among other things. 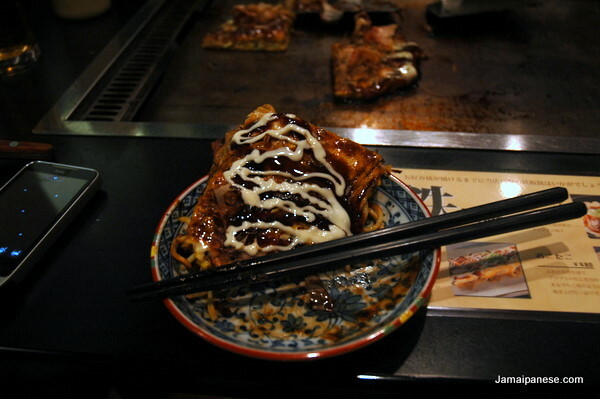 In this post I’ll recap my Okonomiyaki experience. According to Wikipedia, the name “Okonomiyaki” is derived from the word okonomi which means “what you like” or “what you want”, and yaki meaning “grilled” or “cooked”. After a long day exploring Nara, battling tricky deer, recovering from the shock of losing, then recovering my Japan rail pass and being in awe at attractions like Todaiji I retreated to Kyoto in the late evening with a stomach so empty I felt I might want to devour a meat mountain. My Japanese friend was impressed with the fact that I enjoyed Hitsumabushi and continued to tell me stories of how most of the Jamaicans that visit Japan almost never try Japanese food and instead get married to McDonalds. We searched the food court in a mall nextdoor to where we were staying (El Inn Kyoto) and after explaining what was available she encouraged me to try Okonomiyaki. The “old” me would never try something I couldn’t even pronounce properly but my empty stomach and aching feet encouraged me to go for it! let the lightning fast mixing begin! As usual I was very impressed the setting, layout and overall ambiance of the restaurant, service was exceptional and the price of the meals were very reasonable. My Japanese friend had a lot of experience making Okonomiyaki as her mom had owned a restaurant specializing in it while she was growing up. She took over from the chef and transformed into mixing ninja. Okonomiyaki is made from all kinds of ingredients hence the “what you like” reference and I could recognize eggs, shrimp, flour, squid, ginger, cabbage and many other ingredients being tossed around and mixed together into a pancake-like mashup that smelled wonderful as it cooked on the grill built into the table we sat at. 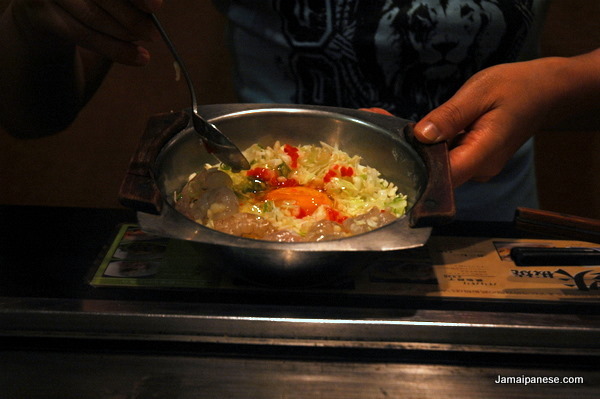 Have you ever tried Okonomiyaki? Soon the meal was ready (beer included) and while me first few bites were exploratory as I tried to save my taste buds from an unfamiliar shock I grew to like to varied tastes punctuated by different sources and toppings. Soon I was stuffed and that short walk to the restaurant didn’t seem as short anymore. Okonomiyaki like Hitsumabushi is one of those Japanese dished I couldn’t see myself eating often but on special occassions and such I’ll have to get me some more! 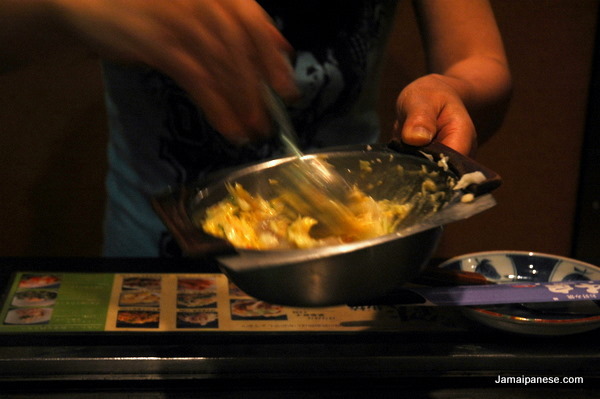 Have you ever tried Okonomiyaki? Is yes, where? In no, Do you want to? Leave a comment below! 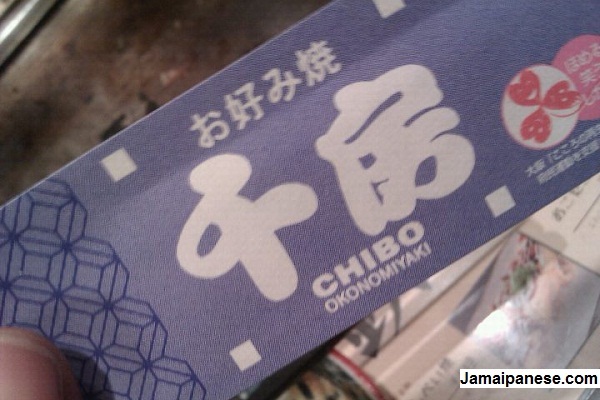 Chibo Okonomiyaki is the retaurant we ate at, kudos for great service! CNNGo creates a list of things that make Tokyo the "world's greatest city"
Great overview and nice photos. If you are interested in more in-depth information on okonomiyaki and recipes, see http://okonomiyakiworld.com – have fun! Okonomiyaki is a regular dish for us at home… in fact we had it just the other night. It’s a great dish to cook yourself, as it’s very easy – or to have out, and enjoy the experience of different flavours. It also tends to be very filling (due to the cabbage and flour base). The most amazing thing I found when I had okonomiyaki for the first time was when my wife put the katsuobushi (shaved dried bonito) and it bends and curls like it’s alive. Freaked me out first time, and I love watching every time I eat okonomiyaki. 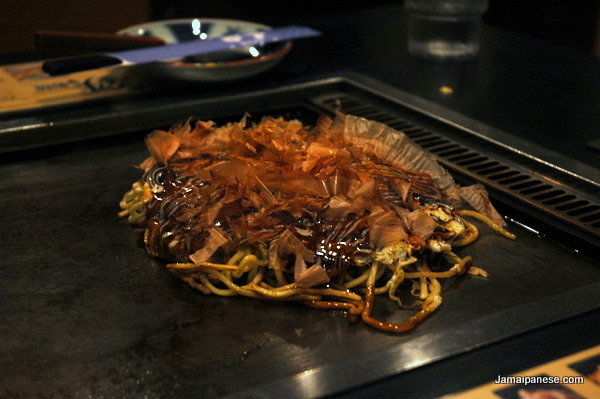 Okonomiyaki is a popular dish all around Japan and is a popular festival food as well. I love the different versions of Okonomiyaki in Japan. 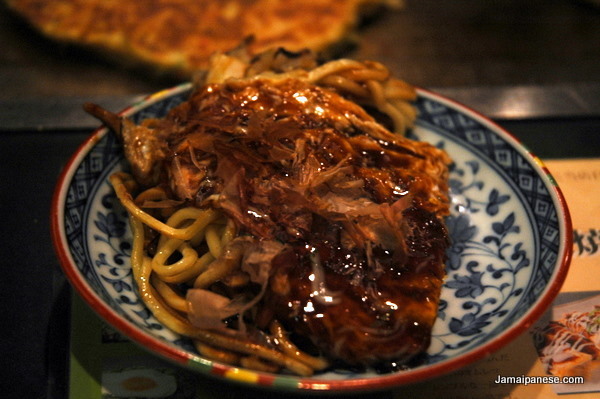 In Hiroshima we had a version called Hiroshima-yaki with yakisoba noodles. Have you tried it? 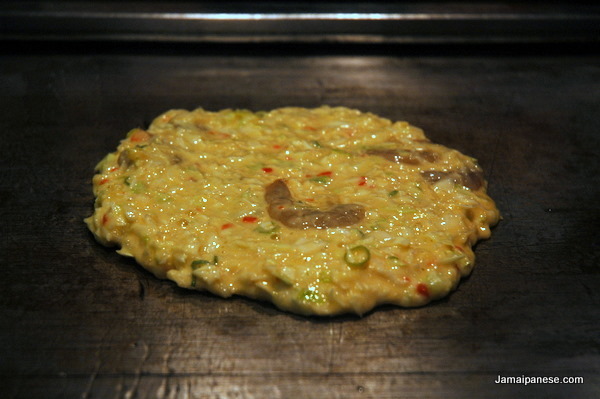 Like Japan Australia says, there is a very special kind of Hiroshima okonomiyaki. Lots more cabbage, lots less batter. Good stuff. “Never eat a food you can’t pronounce” sounds like a good rule for life. As long as you forget how to prounounce “Morrison’s Meatballs”. Full of bone chips, them. Every bite’s another adventure! 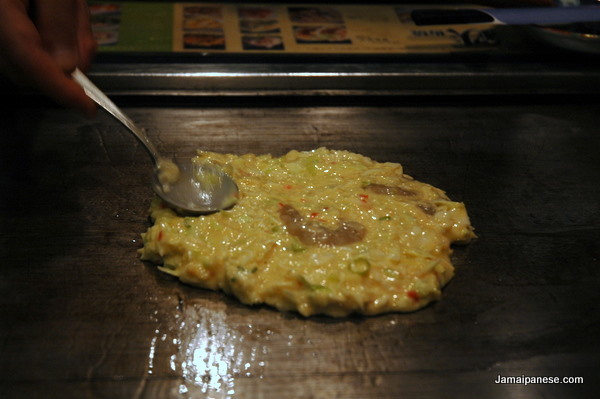 It is interesting to see the friendly rivalry between Osaka and Hiroshima style of Okonomiyaki. But just as good and interesting is the Kyoto style especially with “what you like” reference! Cheers great blog btw and starting to get into your podcast. I have tried okonomiyaki before, in Tsuchiura, Ibaraki, Japan. I must admit that while I enjoyed the mode of preparation and the excitement one might get from cooking on a grill right in front of your own eyes, your very own Japanese food, I didn’t enjoy the taste or flavor. Thank you for sharing your experiences with us though.